The secret to fall proof bones! Why you've been lied to about calcium and osteoporosis (and the 13 year study that links calcium to MORE bone fractures). The hidden link between calcium and obesity (how to lose weight without feeling hungry). Plus, what to eat for longevity (the anti-aging ingredient in the diet of the world's oldest people)...how jellyfish can prevent memory decline... which nutritional supplements cause inflammation...and how you can replace Viagra with this common household food that costs less than $5 per month! Everyone knows you need calcium for strong bones, right? Well, what if I told you, you could get stronger bones...AND... lower your risk for a slew of deadly diseases by consuming LESS calcium. For 13 years, researchers from The Nurses' Health Study (run in large part by Harvard and the largest investigation of its kind in history) followed 122,000 women. Those who had the MOST bone fractures consumed MORE calcium from dairy products. That's Right...MORE Calcium Leads To WEAKER Bones! An 86% jump in heart disease - Following 24,000 Germans for 11 years, scientists found an alarming 86 (eighty six!) percent jump in heart disease in those who supplemented with calcium following common recommendations. Nearly doubles fatal prostate cancer - A Harvard study found men who drank two or more glasses of milk a day were almost twice as likely to develop advanced prostate cancer. A follow up study found men with the highest calcium intake - at least 2,000 milligrams a day - had nearly double the risk of developing fatal prostate cancer. Doubled Sudden Death - Half of a group of 1,471 healthy postmenopausal women took daily calcium supplementation and had almost double the number of heart attacks, strokes and sudden death! If this surprises you, you're not alone. Government agencies, medical institutions, your doctor, and the media have told you calcium was the holy grail of nutrients for decades. That if you didn't get enough your heart would stop...your nerves would stop firing...and your bones would break even if you THOUGHT you were going to fall. As a result, calcium has been pumped into everything from milk substitutes (soy, rice, and almond), juices, tofu, breakfast cereals, other baked goods, and more. But thankfully, now the truth is coming out. If Calcium Doesn't Make Bones Stronger, What Does? It's all revealed in a brand new book - written by Dr. Robert Thompson (voted Best Physician in America in 1996) - that for a limited time, you can get for free. Dr. Thompson first noticed the dangers of calcium while delivering babies as an OBGYN. Certain women would experience a rash of cavities after childbirth. While researching why, he also learned about two factors that cause over 50% of infant deaths...certain deficiencies that lead to lower IQ scores in babies...and even how a woman's placenta can reveal her risk for heart disease later in life. After continued research, he released the first volume of The Calcium Lie in 2008 to get the word out about all the dangers of calcium. 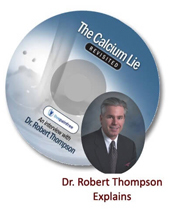 8 years and thousands of copies sold later, Dr. Thompson has updated his findings in the newly released The Calcium Lie II. You can buy it for $19.95. But through this page only I'll give you a copy absolutely free. And now you can too. For just a small shipping and handling charge, I will rush The Calcium Lie II (along with a special bonus) directly to your door. Why Am I Giving Away This Book? My name is Jesse Cannone. In 1999, I badly injured my knee running. And even though I knew all the normal rehabilitation techniques (I am a Master Fitness Trainer, Certified Post-Rehabilitation Specialist, and more) only an "alternative treatment" saved me from surgery. At that moment, I dedicated my life to helping free others from pain...without the use of dangerous drugs or surgery. Since then the company I founded - The Healthy Back Institute® - has helped over 565,385 people in 123 countries free themselves from the shackles of back, neck and other pain. But I firmly believe I never would have injured my knee in the first place if I knew the information in The Calcium Lie II. ...that have skyrocketed from rare cases 100 years ago to the borderline epidemic numbers today would vanish if more people simply knew what Dr. Thompson shares in The Calcium Lie II. Now this isn't what mainstream medicine would have you believe. They want you to think only dangerous drugs and expensive surgeries are your only option for a healthier life. That couldn't be further from the truth. At the bottom of this page you'll see just a few of the thousands of testimonials sent to Dr. Thompson. It is proof once skeptical doctors and regular people alike are finding greater health and quality of life from the information you'll find in The Calcium Lie II. And if researchers and scientists from the most well respected institutions around the world are shedding doubts on calcium, shouldn't you know too? Plus, it was Dr. Thompson’s original work that has enlightened them, but they’re not going far enough. You’ve got to get your hands on the information and be ahead of the medical establishment and take control of your health. My personal missions is, and has been for over 15 years now, to make sure people who want to live healthy, productive, and energetic lives have the information they need to do so. It pains me to see people suffering unnecessarily... overweight, sick, in pain and all because of misinformation. I know with just a few simple changes, these same people can be skinnier, have more energy, and live longer, healthier and happier lives. I can only help people who care about their health. Who want to live full, vibrant lives...be productive...and be there for their friends and family. I've spent $50,000 of my own money printing up 10,000 copies of this book to give away free. I'm literally bending over backwards to make it as easy as possible to get this lifesaving information in your hands. But once these copies are gone, you'll no longer be able to get The Calcium Lie II for free. Here's just a small sample of the thousands of thank you letters Dr. Thompson has received from readers, patients, and colleagues. - Dr. Hyla Cass M.D. - Dr. Jacob Teitelbaum, M.D. And because I know you are busy, you will also get another free gift. Over the course of an afternoon I grilled Dr. Thompson on all of the important points of The Calcium Lie II. I recorded this session. And sent the tapes to my editor. What was left was 53 minutes of Dr. Thompson’s core philosophy on the dangers of calcium. And his best secrets for fighting obesity, diabetes, cancer, hardening of the arteries, heart disease, hypertension, hypothyroidism, osteoporosis, depression, migraines, dementia, many autoimmune diseases and more. Even if you don't read the book, this short interview distills all of the key points of The Calcium Lie II into an easy to listen format. You will hear everything you need for optimum health. Just click the Ship Me The Book button below and fill out the request form, and I'll give you access to this interview with Dr. Thompson along with the book absolutely free.